Please let us know if you would be interested in signing up for our Insider's Club. We'll provide you with exclusive advance notices of any new Top of the Class educational tools as well as our availability for seminars and individual consultations. 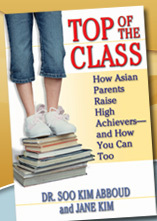 Learn how the principles in Top of the Class can help your child maximize his or her academic success! Interested in Joining the Insiders Club?